Safe to say that Chris Bosh has gotten a lot of hate over the last couple of seasons after signing in Miami with LeBron James to join Dwayne Wade as the elite triumvirate in the league, a lot of it being undeserved but that's a different story. People roll their eyes when Heat coach Erik Spoelstra has said that Bosh was the team's most valuable player but after losing him in game 1 of their second round series against the Indiana Pacers to an abdominal strain that could keep him out of the rest of the playoffs, they have struggled; Indiana won two in a row by outscoring Miami by 22 points combined before the Heat claimed game 4 today. We are seeing proof that without Bosh, Miami is not winning a title. You watch the Heat on offense without Bosh, it is clear to see why their offense is out of whack right now as it looks that the offense is clogged as the loss of Bosh has killed the Heat's pick-and-roll because those who have replaced Bosh, Udonis Haslem, Ronny Turiaf and Joel Anthony, have no offensive game whatsoever and they are relegated to clogging the paint since they cannot spread out the offense since they have no jump shot. The great Tom Haberstroh notes that nobody that took at least 100 shots from 10-15 feet this season had a higher conversion rate than Bosh's 49.5 percentage. 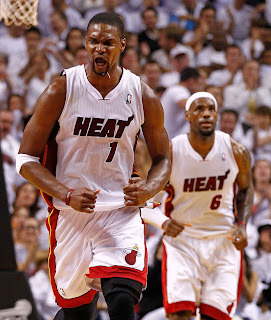 Bosh's tremendous mid-range shot makes the Heat's pick-and-roll game with either James or Wade so lethal. Now the Heat have no offense in the paint, in fact it just looks like Indiana's big men are all but ignoring Miami's big men while sitting down low as somewhat of a roadblock to the basket. Both Wade and James are forced to settle for pull-up jumpers because they have nowhere to go. And they are now the Heat's only two scoring options. Just look at today's victory at the Bankers Life Fieldhouse: James (40 points) and Wade (30 points) combined for 70 of their club's 101 points and only one other scoring was in double-digits in Haslem with 14 points. This is why the Heat have struggled with a solid Pacers team because they only have two real scoring threats who are blocked from getting to the basket. Thus, Bosh's absence has been crippling. Even if the Heat get by the Pacers, which I ultimately think they will, they won't have an walk in the park, particularly if they get the Boston Celtics. So they have to hope that Bosh heals soon and return much quicker than the normal recovery from an abdominal strain.